Floor - Sydney de Melker, Steve Joubert, Jack Hirsch, Bob Loubser, Insets - Japie Krige, WS 'Sommie'; Morkel. 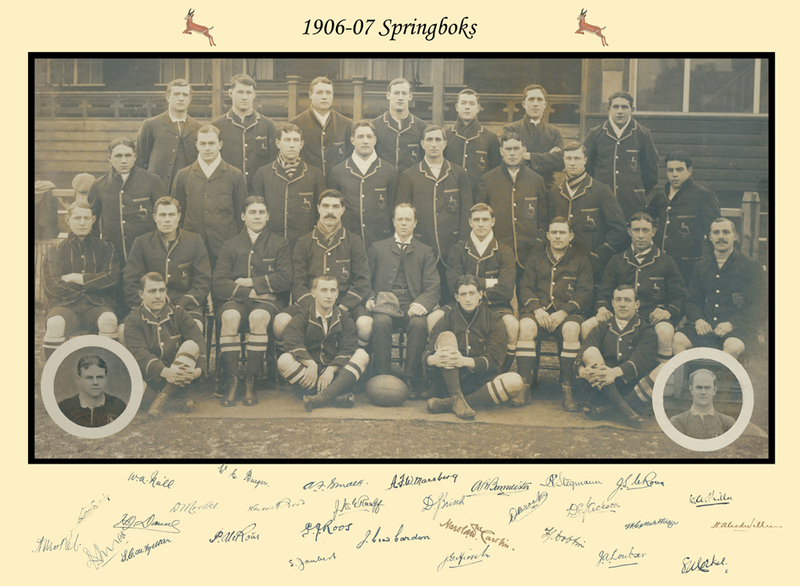 The 1906-07 Springbok tour was a watershed in South African sport. 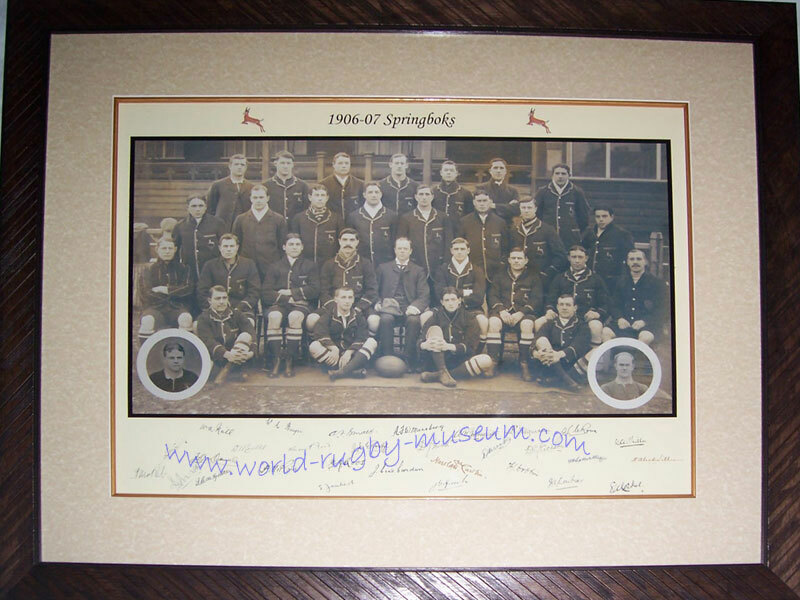 It was during this tour that the term 'Springboks' was coined for a South African team and for the majority of the 100 years following the tour the Springboks have been the most feared side in Rugby Football. The Springbok emblem and the term 'Springbok' to denote a South African sportsperson all stem from this remarkable tour. Coming only four years after the terrible Boer War which divided the country, the tour was responsible for uniting the 'Afrikaaners' and the 'Colonials' in one cause, the defeat of the British rugby teams. 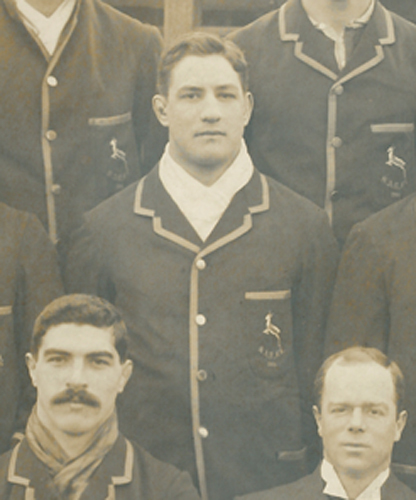 The 1906-07 tour firmly established the 'Boks as the world leaders in rugby, they defeated Wales 11 - 0 at Swansea, less than a year after Wales had beaten the All Blacks. Wales were in the middle of their first golden era and won triple crowns in 1905, 1908 and 1909 and this victory lifted the Springboks to the top of the world rankings. During the tour the Springboks played 29 matches winning 26, losing two with one match drawn. They scored 608 points with only 85 against. We are offering this limited edition photographic print of the team complete with facsimile autographs. 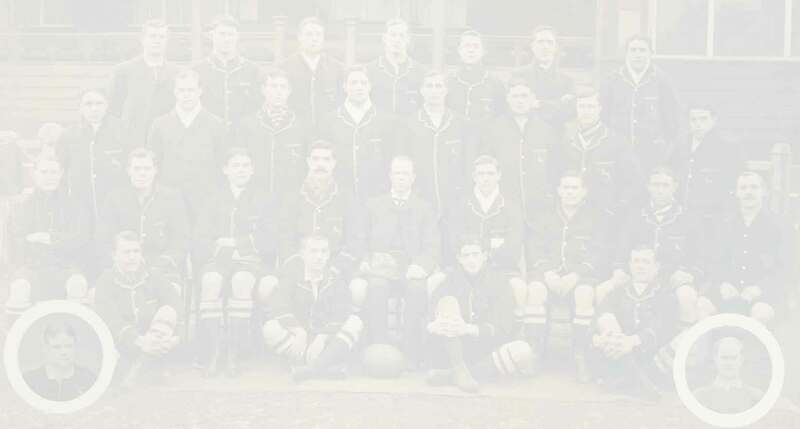 The photograph was taken at Cardiff Arms Park at the end of the tour, the last match in Great Britain was against Cardiff on new year's day 1907, it was taken around this date prior to the team leaving for France. The two players in the inserts, Japie Krige and Sommie Morkel were in hospital at the time of the photo, both with appendicitis . The autographs are printed, they are scans of originals which were collected during the tour. Pictured below is a close up of JWE 'Klondyke' Raaff together with his autograph. This gives you some idea of the quality of this fantastic print. Each print is accompanied by a quality Certificate of Authenticity. Numbers 1 - 29 relate to each match played and will carry information about that match. 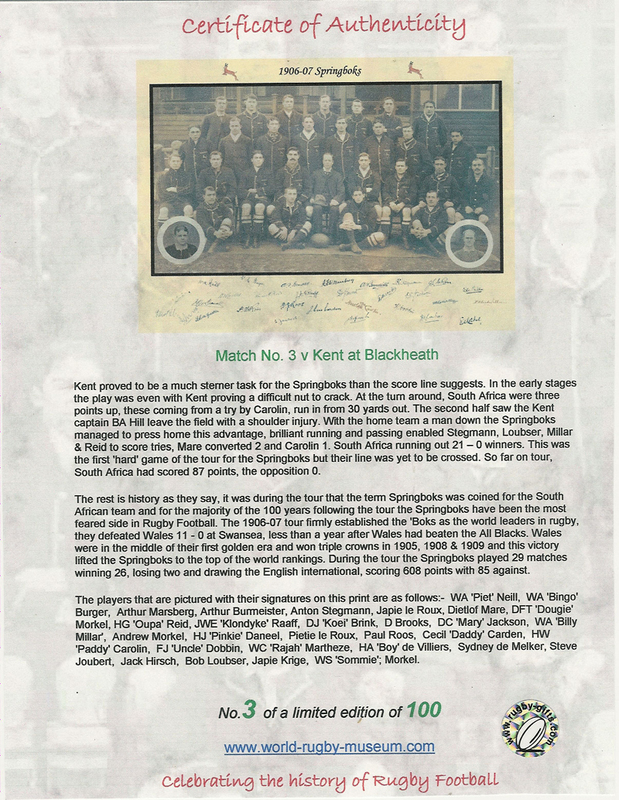 For example, the third match played was against Kent and the certificate is dedicated to this match, see the COA below for this number print. Numbers 30 - 59 relate to individual players and management. If required you can choose your own number, click on the link below for the availability of each number. A frame similar to that above is included in the 'framed' price, framed prints are available to UK addresses only.